This article is about the Frisian languages, as spoken in the Netherlands and Germany. For other uses, see Frisian language (disambiguation). The Frisian (/ˈfriːʒən/, also /ˈfrɪʒən/ or /ˈfrɪʒiən/) languages are a closely related group of Germanic languages, spoken by about 500,000 Frisian people, who live on the southern fringes of the North Sea in the Netherlands and Germany. The Frisian languages are the closest living language group to the Anglic languages; the two groups make up the Anglo-Frisian languages group. However, modern English and Frisian are not mutually intelligible, nor are Frisian languages intelligible among themselves, due to independent linguistic innovations and foreign influences. There are three different Frisian languages: West Frisian, by far the most spoken of the three, is an official language in the Dutch province of Friesland, where it is spoken on the mainland and on two of the West Frisian Islands: Terschelling and Schiermonnikoog. It is also spoken in four villages in the Westerkwartier of the neighbouring province of Groningen. North Frisian is spoken in the northernmost German district of Nordfriesland in the state of Schleswig-Holstein: On the North Frisian mainland, and on the North Frisian Islands of Sylt, Föhr, Amrum, and the Halligs. It is also spoken on the islands of Heligoland and Düne, in the North Sea. The third Frisian language, Saterland Frisian, a variant of East Frisian, is only spoken in the municipality of Saterland in the Lower Saxon district of Cloppenburg. Surrounded by bogs, the four Saterlandic villages lie just outside the borders of East Frisia, in the Oldenburg Münsterland region. In East Frisia, East Frisian Low Saxon is spoken, which is not a Frisian language, but a variant of Low German/Low Saxon. Depending upon their location, the three Frisian languages have been heavily influenced by and bear similarities to Dutch and Low German/Low Saxon. Additional shared linguistic characteristics between the Great Yarmouth area and Friesland are likely to have resulted from the close trading relationship these areas maintained during the centuries-long Hanseatic League of the Late Middle Ages. There are three varieties of Frisian: West Frisian, Saterland Frisian, and North Frisian. Some linguists consider these three varieties, despite their mutual unintelligibility, to be dialects of one single Frisian language, whereas others consider them to be three separate languages, as do their speakers. West Frisian is strongly influenced by Dutch. The other Frisian languages, meanwhile, have been influenced by Low German and German. The North Frisian language especially is further segmented into several strongly diverse dialects. Stadsfries and West Frisian Dutch are not Frisian, but Dutch dialects influenced by West Frisian. 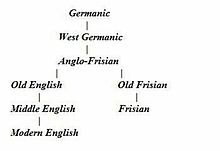 Frisian is called Frysk in West Frisian, Fräisk in Saterland Frisian, and Frasch, Fresk, Freesk, and Friisk in the dialects of North Frisian. The situation in the Dutch province of Groningen and the German region of East Frisia is more complex: The local Low German/Low Saxon dialects of Gronings and East Frisian Low Saxon are a mixture of Frisian and Low Saxon dialects; it is believed that Frisian was spoken there at one time, only to have been gradually replaced by Low Saxon. This local language is now, in turn, being replaced by standard Dutch and German. Most Frisian speakers live in the Netherlands, primarily in the province of Friesland, since 1997 officially using its West Frisian name of Fryslân, where the number of native speakers is about 400,000, which is about 75% of the inhabitants of Friesland. An increasing number of native Dutch speakers in the province are learning Frisian as a second language. In Germany, there are about 2,000 speakers of Saterland Frisian in the Saterland region of Lower Saxony; the Saterland's marshy fringe areas have long protected Saterland Frisian speech there from pressure by the surrounding Low German and standard German, but Saterland Frisian still remains seriously endangered because of the small size of the speech community and of the lack of institutional support to help preserve and spread the language. In the North Frisia (Nordfriesland) region of the German state of Schleswig-Holstein, there were 10,000 North Frisian speakers in the 1970s. Although many of these live on the mainland, most are found on the islands, notably Sylt, Föhr, Amrum, and Heligoland. The local corresponding North Frisian dialects are still in use. As a regional language in the Netherlands, West Frisian is only spoken by a certain demographic, specifically rural, lower-income people in contrast with the Dutch-speaking upper-class. West Frisian-Dutch bilinguals are split into two categories: Speakers who had Dutch as their first language tended to maintain the Dutch system of homophony between plural and linking suffixes when speaking West Frisian, by using the West Frisian plural as a linking morpheme. Speakers who had West Frisian as their first language often maintained the West Frisian system of no homophony when speaking West Frisian. Speakers of the many Frisian dialects may also be found in the United States and Canada. Saterland and North Frisian are officially recognised and protected as minority languages in Germany, and West Frisian is one of the two official languages in the Netherlands, the other being Dutch. ISO 639-1 code fy and ISO 639-2 code fry were assigned to "Frisian", but that was changed in November 2005 to "Western Frisian". According to the ISO 639 Registration Authority the "previous usage of [this] code has been for Western Frisian, although [the] language name was 'Frisian'". The new ISO 639 code stq is used for the Saterland Frisian language, a variety of Eastern Frisian (not to be confused with East Frisian Low Saxon, a West Low German dialect). The new ISO 639 code frr is used for the North Frisian language variants spoken in parts of Schleswig-Holstein. The Ried fan de Fryske Beweging is an organization which works for the preservation of the West Frisian language and culture in the Dutch province of Friesland. The Fryske Academy also plays a large role, since its foundation in 1938, to conduct research on Frisian language, history, and society, including attempts at forming a larger dictionary. Recent attempts have allowed Frisian be used somewhat more in some of the domains of education, media and public administration. Nevertheless, Saterland Frisian and most dialects of North Frisian are seriously endangered and West Frisian is considered as vulnerable to being endangered. Moreover, for all advances in integrating Frisian in daily life, there is still a lack of education and media awareness of the Frisian language, perhaps reflecting its rural origins and its lack of prestige Therefore, in a sociological sense it is considered more a dialect than a standard language, even though linguistically it is a separate language. For L2 speakers, both the quality and amount of time Frisian is taught in the classroom is low, concluding that Frisian lessons do not contribute meaningfully to the linguistic and cultural development of the students. Moreover, Frisian runs the risk of dissolving into Dutch, especially in Friesland, where both languages are used. 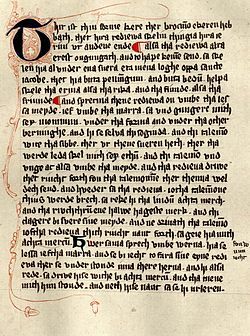 Old Frisian text from 1345. In the Early Middle Ages the Frisian lands stretched from the area around Bruges, in what is now Belgium, to the river Weser, in northern Germany. At that time, the Frisian language was spoken along the entire southern North Sea coast. Today this region is sometimes referred to as Great Frisia or Frisia Magna, and many of the areas within it still treasure their Frisian heritage, even though in most places the Frisian languages have been lost. Frisian is the language most closely related to English and Scots, but after at least five hundred years of being subject to the influence of Dutch, modern Frisian in some aspects bears a greater similarity to Dutch than to English; one must also take into account the centuries-long drift of English away from Frisian. Thus the two languages have become less mutually intelligible over time, partly due to the marks which Dutch and Low German have left on Frisian, and partly due to the vast influence some languages (in particular Norman French) have had on English throughout the centuries. Old Frisian, however, was very similar to Old English. Historically, both English and Frisian are marked by the loss of the Germanic nasal in words like us (ús; uns in German), soft (sêft; sanft) or goose (goes; Gans): see Anglo-Frisian nasal spirant law. Also, when followed by some vowels, the Germanic k softened to a ch sound; for example, the Frisian for cheese and church is tsiis and tsjerke, whereas in Dutch it is kaas and kerk, and in High German the respective words are Käse and Kirche. Contrarily, this did not happen for chin and choose, which are kin and kieze. One major difference between Old Frisian and modern Frisian is that in the Old Frisian period (c.1150-c.1550) grammatical cases still existed. Some of the texts that are preserved from this period are from the 12th or 13th, but most are from the 14th and 15th centuries. Generally, all these texts are restricted to legalistic writings. Although the earliest definite written examples of Frisian are from approximately the 9th century, there are a few examples of runic inscriptions from the region which are probably older and possibly in the Frisian language. These runic writings however usually do not amount to more than single- or few-word inscriptions, and cannot be said to constitute literature as such. The transition from the Old Frisian to the Middle Frisian period (c.1550-c.1820) in the 16th century is based on the fairly abrupt halt in the use of Frisian as a written language. Up until the 15th century Frisian was a language widely spoken and written, but from 1500 onwards it became an almost exclusively oral language, mainly used in rural areas. This was in part due to the occupation of its stronghold, the Dutch province of Friesland (Fryslân), in 1498, by Duke Albert of Saxony, who replaced West Frisian as the language of government with Dutch. Afterwards this practice was continued under the Habsburg rulers of the Netherlands (the German Emperor Charles V and his son, the Spanish King Philip II), and even when the Netherlands became independent, in 1585, West Frisian did not regain its former status. The reason for this was the rise of Holland as the dominant part of the Netherlands, and its language, Dutch, as the dominant language in judicial, administrative and religious affairs. In this period the great Frisian poet Gysbert Japiks (1603–66), a schoolteacher and cantor from the city of Bolsward, who largely fathered modern West Frisian literature and orthography, was really an exception to the rule. His example was not followed until the 19th century, when entire generations of West Frisian authors and poets appeared. This coincided with the introduction of the so-called newer breaking system, a prominent grammatical feature in almost all West Frisian dialects, with the notable exception of Southwest Frisian. Therefore, the Modern West Frisian period is considered to have begun at this point in time, around 1820. The revival of the West Frisian Language comes from the poet Gysbert Japiks, who had begun to write in the language as a way to show that it was possible, and created a collective West Frisian identity and West Frisian standard of writing through his poetry. Later on, Johannes Hilarides would build off Gysbert Japik's work by building on West Frisian orthography, particularly on its pronunciation; he also, unlike Japiks, set a standard of the West Frisian language that focused more heavily on how the common people used it as an everyday language. Perhaps the most important figure in the spreading of the West Frisian language was J. H. Halbertsma (1789–1869), who translated many works into the West Frisian language, such as the New Testament  He had however, like Hilarides, focused mostly on the vernacular of the West Frisian language, where he focused on translating texts, plays and songs for the lower and middle classes in order to teach and expand the West Frisian language. This had begun the effort to continuously preserve the West Frisian language, which continues unto this day. It was however not until the first half of the 20th century that the West Frisian revival movement began to gain strength, not only through its language, but also through its culture and history, supporting singing and acting in West Frisian in order to facilitate West Frisian speaking. It was not until 1960 that Dutch began to dominate West Frisian in Friesland; with many non-Frisian immigrants into Friesland, the language gradually began to diminish, and only survives now due to the constant effort of scholars and organisations. The province of Friesland rather than the language itself has become in recent years a more important part of West Frisian identity, so the language has become less important for cultural preservation purposes. It is especially written West Frisian that seems to have trouble surviving, with only 30% of the West Frisian population competent in it; it had disappeared in the 16th century and continues to be barely taught today. Frisian languages belong to the West Germanic branch of the Indo-European languages, the most widespread language family in Europe and the world. Its closest living genealogical relatives are the Anglic languages, i.e. English and Scots; the two groups make up the Anglo-Frisian languages group. West Frisian language, spoken in the Netherlands. East Frisian language, spoken in Lower Saxony, Germany. North Frisian language, spoken in Schleswig-Holstein, Germany. This is a small portion of the Frisian Family Tree. Below is the Lord's Prayer from the Frisian Bible third edition, published in 1995, with the corresponding English text from the 1662 Book of Common Prayer. Jou ús hjoed ús deistich brea. allyk ek wy ferjouwe ús skuldners. en de hearlikheid oant yn ivichheid. "Amen"
* See also West Frisian language#Sample text. ** Which was changed to "who", in earth to "on earth," and them that to "those who" in the 1928 version of the Church of England prayer book and used in other later Anglican prayer books too. However, the words given here are those of the original 1662 book as stated. Saterland Frisian: Die Wänt strookede dät Wucht uum ju Keeuwe un oapede hier ap do Sooken. North Frisian (Mooring dialect): Di dreng aide dåt foomen am dåt kan än mäket har aw da siike. West Frisian: De jonge streake it famke om it kin en tute har op 'e wangen. Gronings: t Jong fleerde t wicht om kinne tou en smokte heur op wange. East Frisian Low Saxon: De Jung (Fent) straktde dat Wicht um't Kinn to un tuutjede hör up de Wangen. German: Der Junge streichelte das Mädchen ums Kinn und küsste es (sie) auf die Wange. Dutch: De jongen aaide (streelde, streek) het meisje langs/over haar/de kin en kuste/zoende haar op de wangen. Afrikaans: Die seun streel die meisie oor haar/die ken en soen haar op die wange. English: The boy stroked the girl around the chin and kissed her on the cheeks. Danish: Drengen strøg/aede pigen på hagen og kyssede hende på kinden. NB: These aren't always literal translations of each other. ^ Hammarström, Harald; Forkel, Robert; Haspelmath, Martin, eds. (2017). "Frisian". Glottolog 3.0. Jena, Germany: Max Planck Institute for the Science of Human History. ^ Gooskens, Charlotte (2004). "The Position of Frisian in the Germanic Language Area". In Gilbers, D. G.; Knevel, N. (eds.). On the Boundaries of Phonology and Phonetics. Groningen: Department of Linguistics. ^ a b c Extra, Guus; Gorter, Durk (2001-01-01). The Other Languages of Europe: Demographic, Sociolinguistic, and Educational Perspectives. Multilingual Matters. ISBN 9781853595097. ^ a b c Bremmer, Rolf Hendrik (2009-01-01). An Introduction to Old Frisian: History, Grammar, Reader, Glossary. John Benjamins Publishing. ISBN 9027232555. ^ "Gegenwärtige Schätzungen schwanken zwischen 1.500 und 2.500." Marron C. Fort: Das Saterfriesische. In: Horst Haider Munske, Nils Århammar: Handbuch des Friesischen – Handbook of Frisian Studies. Niemayer (Tübingen 2001). ^ "Frisian language use and ethnic identity: International Journal of the Sociology of Language". www.degruyter.com. Retrieved 2015-10-30. ^ Christian Galinski; Rebecca Guenther; Håvard Hjulstad. "Registration Authority Report 2004-2005" (PDF). p. 4. Archived from the original (PDF) on 2007-10-20. Retrieved 2007-11-23. ^ a b Fishman, Joshua A. (2001-01-01). Can Threatened Languages be Saved? : Reversing Language Shift, Revisited : a 21st Century Perspective. Multilingual Matters. ISBN 9781853594922. ^ "Atlas of languages in danger | United Nations Educational, Scientific and Cultural Organization". www.unesco.org. Retrieved 2015-10-28. ^ a b c Deumert, Ana; Vandenbussche, Wim (2003-10-27). Germanic Standardizations: Past to Present. John Benjamins Publishing. ISBN 9789027296306. ^ Gooskens, Charlotte; Heeringa, Wilbert (May 2012). "The Position of Frisian in the Germanic Language Area" (PDF). ResearchGate. Retrieved 25 August 2017. ^ "English to Frisian dictionary". ^ a b c d e Linn, Andrew R.; McLelland, Nicola (2002-12-31). Standardization: Studies from the Germanic languages. John Benjamins Publishing. ISBN 9789027283672. ^ a b Yngve, Victor; Wasik, Zdzislaw (2006-11-25). Hard-Science Linguistics. A&C Black. ISBN 9780826492395. ^ Linn, Andrew Robert; McLelland, Nicola (2002-01-01). Standardization: Studies from the Germanic Languages. John Benjamins Publishing. ISBN 9027247471. 'Hover & Hear' West Frisian pronunciations, and compare with equivalents in English and other Germanic languages. This page was last edited on 11 April 2019, at 22:57 (UTC).